Sindhura here. I'm here to introduce you to our awesome Spotlight Designer- Suchismita.Suchismita won our May month challenge and we are delighted to have her as our guest. I live in Hyderabad, India with my husband and work at a professional services firm as a business editor. As a couple, we like to travel and, since my husband is a hobby photographer, we spend a lot of time taking, viewing, and talking about photos. My love for stationery and the abundance of photographs directly led into me finally taking the plunge in pursuing my new hobby--creating photo albums and scrapbooks. I was always fond of paper and stationery, and photo albums! (I browse family albums regularly, design and order photobooks online, the only home decor I buy are photo frames--I pretty much do anything I can to preserve memories.) I believe my scrapbooking efforts are my little way of preserving this love. Maybe this is why my albums until now have all been gifts for friends, or for my own use. Why I started blogging--well...all crafters know how we just CANNOT stop talking about papers and supplies and our work! I figured soon enough that my husband would have to look for alternative accommodation if he regularly had to admire all my papers and every new Pinterest discovery! 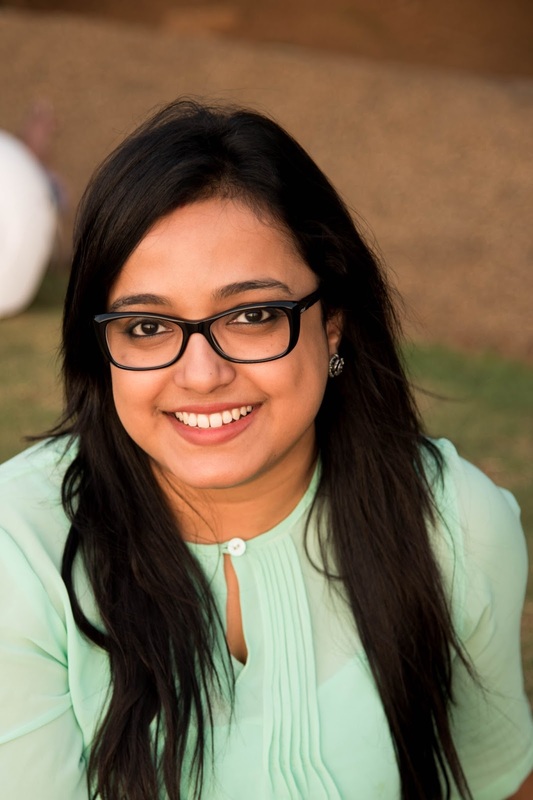 I wanted to reach out to the crafting community to share my enthusiasm and excitement, and definitely to inspire and guide. Given that I have only weekends to craft in, I am only about a 100 days (52 weekends in a year) old as a crafter--I don't think I have a favorite technique yet! Among the ones I currently use, distressing and dry embossing are my favorites! 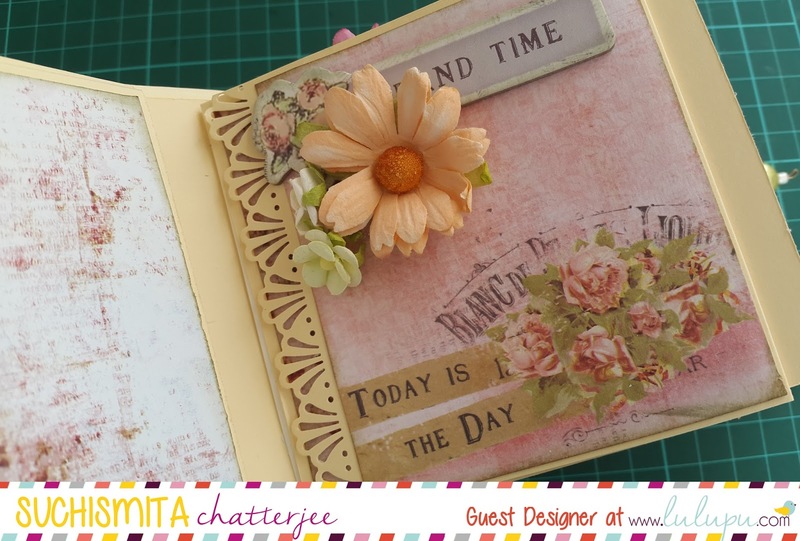 Elegant vintage is how I'd put it maybe--I love clean, interactive pages with beautiful messy clusters of metal and floral embellishments in the corner, or cute papers made into interactive pages with minimal embellishment. I am very fond of clever inserts and tag-along mini books inside albums. About a year now, and been a blogger since February 2016. 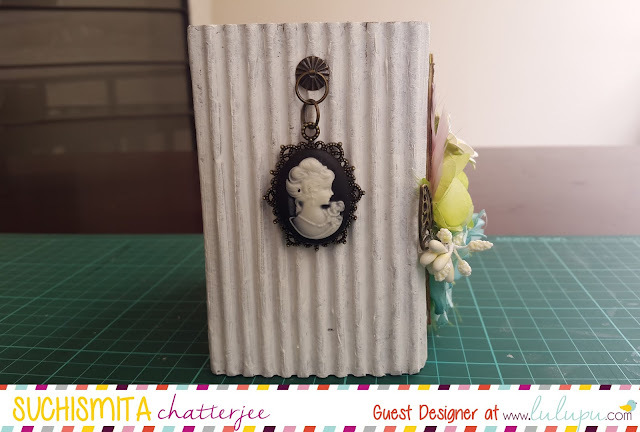 Distressed edges, chunky charm dangles, clusters of flowers and metal, photo frames/cameos, and lots of tags! I will answer both together--Ginger Ropp of My Sisters Scrapper remains my favorite teacher, she is absolutely the best! 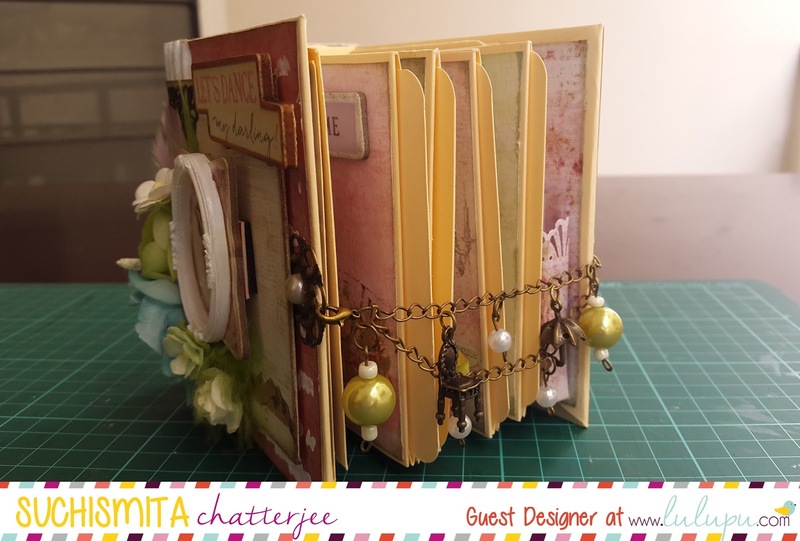 I have also to thank Rina of Scrapbook Fashionista Designs by Rina for all the inspiration. There are a host of others whose work I absolutely adore (Shellie Geigle, Terry's Scrapbooks, Claire Charvill, Anne Rostad being a few of them)--but this blog post will never end if I were to list them all. 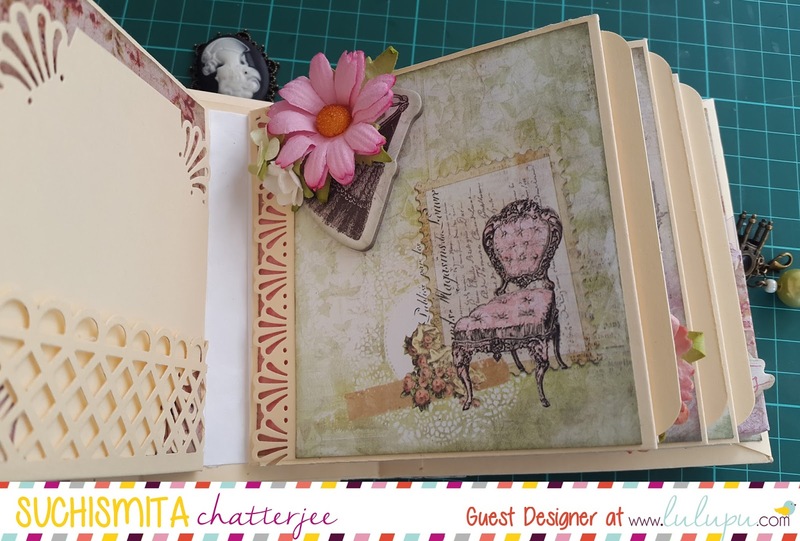 A few Indian crafters whose work lured me into paper crafting are Rajni Chawla, Ashmita Roy (of Artsomecraft), and Kavitha (of Bitsnpieces). I just completed two guest design projects for the Artsomecraft blog--these were two mini albums featuring Kaisercraft Thread and Needle and Lake House Collections. Prima and Kaisercraft are my absolute favourites! 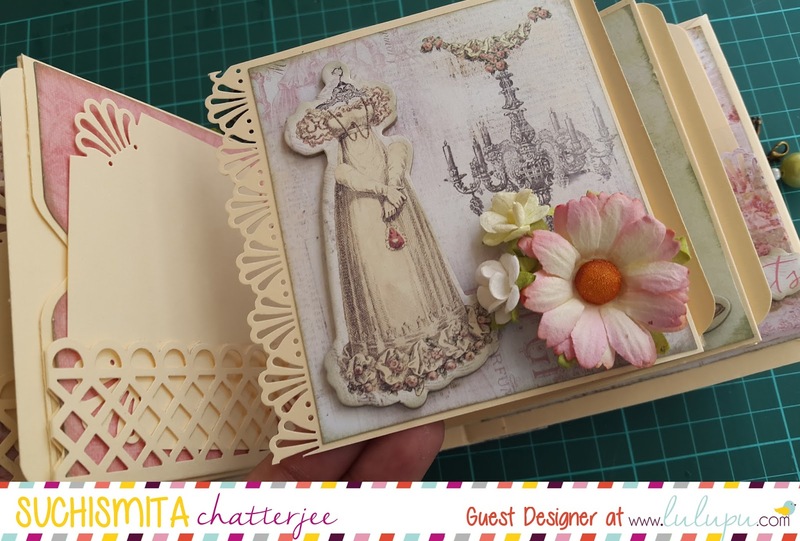 I am enjoying a bit of a break right now (and stocking up on inspiration) before I jump into into a whole host of itty bitty mini albums--lots of presents overdue! 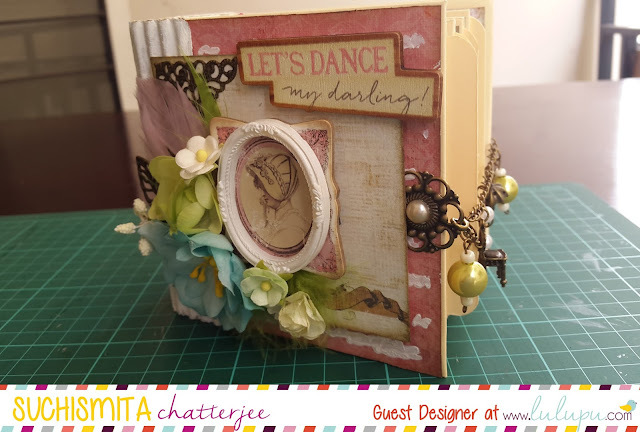 She made an adorable album for this post and we can't wait to share it with you!Over to her now.. 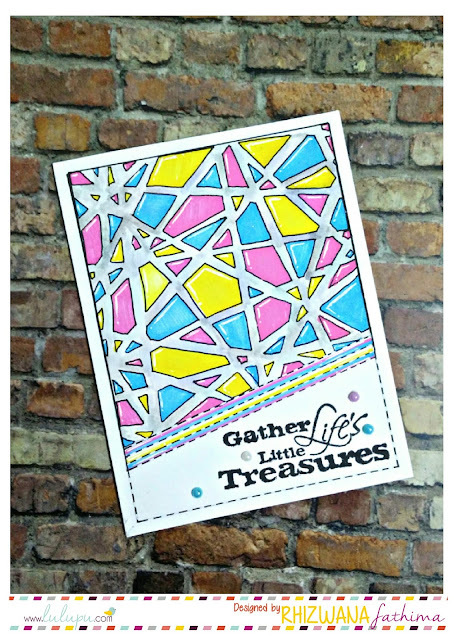 Very excited to share with you my first Guest DT project and tutorial for Lulupu. My bag of goodies from Lulupu included this lovely pack of Prima Royal Menagerie flowers (seen on the cover)--and I just HAD TO use them! Since I did not have the Royal Menagerie collection, I dug around in my Prima stash and found the Debutante collection which was released at the same time as the Royal Menagerie and seemed to coordinate well with the latter. The album measures 4.25x4.25 inches and the pages measure 4x4 inches. There are four page units, with a 0.5 inch gusset between pages. 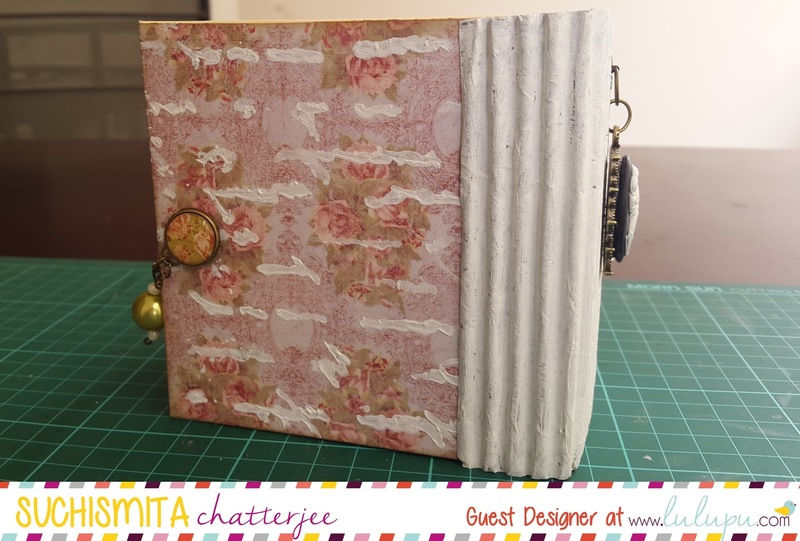 I have used a pure Tyvek Stack-the-Deck hinge system (designed by Laura Denison of Following the Paper Trail) for this album. The spine is up-cycled packaging--corrugated brown paper which I painted white with gesso. The brad holding the charm closure in place is a coordinating brad from the Debutante collection. 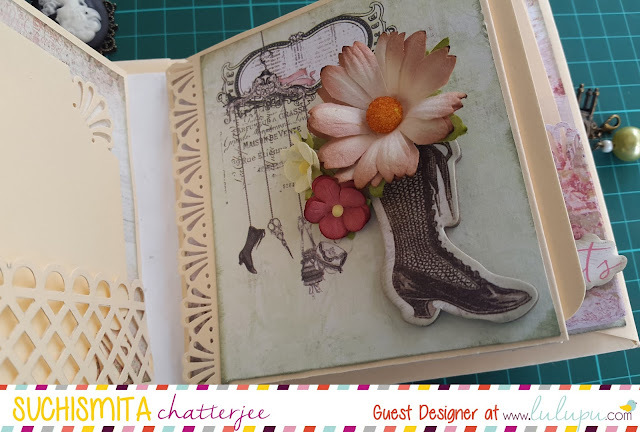 I'll quickly take you through the pages and inside flaps before we head to the project share video and tutorial--where I show you how to make each of the pages (with interactivity). The page build is inspired by Image of the Creator on YouTube. From how far I could check, she does not have a tutorial for pages this size. I figured out the page build myself and modified it to add pockets and tags--I will show you how I went about it. Please head over to YouTube for a detailed flip-through. Thanks so much for stopping by today :) I hope you liked my project. If you would like to make a similar album, follow my tutorial on LulupuTV! Click HERE for the video. Aaaah!! Isn't the album a stunner?! I just love all those gorgeous flowers she used on the album! Gorgeous work! 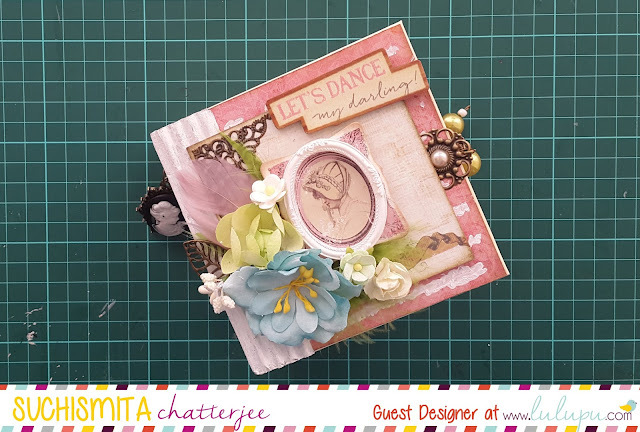 Beautiful papers and awesome embellishment work! Very nice work shared here.